As we lie on the dirt, in the warm South Dakota sun, my new friends and I look out over the open landscape. We had just spent the last week turkey hunting in South Dakota. Since the weather had finally cleared up, we headed out to bust some critters. “I’ve got one. About 80 yards, next to the mound. He’s standing up.” I’ve got the crosshairs lined up and just off to the left to compensate for the wind. Micah lines up the Vortex Viper HD spotting scope on him and gives me the green light. 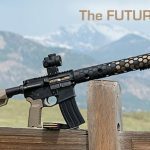 I squeeze the trigger of the Howa HS Precision Rifle while watching the little Prairie Dog smell the air before flipping through the air and landing on its back after being slammed with a .223 V-SHOK bullet from Federal Premium. Micah confirms the shot as we quickly replay the footage with his phone still attached to the Phone Skope. “Got it!” I shout as a round of high-fives travels through the group. The group consists of 2 camera guys (Micah & Connor), Autumn (one of the hunting guides), Stephanie Mallory (a writer for RealTree),and Joe Byers (a fellow writer and friend). It’s Autumn’s turn, she lines up the shot, laying across an abandoned hole. I see her shoulder absorb the recoil of the Howa rifle and another Prairie Dog flips over into the dirt. Flip after flip, dog after dog, we watch as they flip and fly across the South Dakota prairie with the dust from the dry and barren landscape splashing with every shot. If you’re like me you probably want to know exactly why ranchers despise these cute little critters. Not only do they dig hundreds of holes to their tunnel system, but they also destroy the grasses so the cattle can’t graze there. Plus, horses and cattle occasionally step in the holes and break their legs, causing the ranchers to have to put them down and losing profit. Typically, the fleas that live on the prairie dogs carry Bubonic Plague, meaning that no one picks them up with their bare hands. If they are removing the carcasses, the ranch hands use thick leather gloves and biohazard precautions to prevent the fleas from getting on them. So what happens when a few Prairie Dogs decide to move to a new location? The ENTIRE community goes with them, leaving the town completely abandoned. Once a town is empty, a few different things can happen. First, Burrowing Owls can move in and make some use of the existing tunnels. Second, the walls of the tunnels and chambers become weak and the whole things caves in, leaving a huge crater in the ground. Third, the rancher just fences off that section and it sits, unused until the grasses eventually grow back, if it ever grows back. So it’s not surprising then that when a rancher on horseback observed us setting up he invited us to do him a favor. Having validated who we were he welcomed us to take out as many Prarie Dogs as we wanted. Once we got the green light, we slipped through the barbed wire strands and got set up on our respective dirt mounds. We sit and discuss all of this while watching them flip over or watching the dirt splash around them as we miss the longer shots. At one point, Wes takes a shot and hits a dog in the back legs with an AR rifle chambered in Alexander Arms pioneered 6.5 Grendel. Loaded with Horanady ammo, the critter is stunned and it starts limping away, desperately trying to make it back to its hole. Wes fires another shot. Miss. I line up my crosshairs right on it as the prairie dog starts running faster towards the hole. Taking a deep breath, I squeeze the trigger and watch the dog roll onto its back and its friends scatter back to their holes. You can literally sit there all day and wait for these critters to come out of their holes for the next round. It’s the Mid-West’s version of hog hunting, everyone wants to do it and it’s a load of fun! But what do you think? Let me know in the comments below! This entry was posted in Special Hunting Weapons & Tactics™ - The Center of Gravity for Tactical and Long Range Hunting and tagged .223, 6.5 Grendel, Federal Premium Ammo, Hornady, Howa, Hunting, Prairie Dog by guestwriter. Bookmark the permalink. It is great fun and does a service for the ranchers. It really gets chalanging at 400 yards and beyond. Suppressors also increase the fun level. Some of the thinner jacket high velocity varmit rounds eliminate the ability to pick them up. Sounds like loads of fun. Ive never lived somewhere to do this type hunting, but have hunted big game in many states out west. Would love to try this some time. Its always good to get to hunt/practice shooting, especially when you are doing a service for a local rancher/farmer. Great way to improve hunting image.